I just love Victorian novels and this one in particular sounds really good! So far, I'm only seeing this listed on Amazon UK, but I'll keep an eye out and let you know as soon as it's listed on Amazon US. 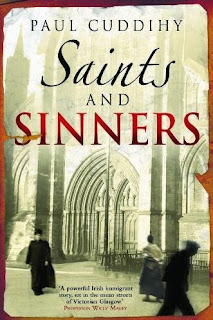 SYNOPSIS: A fast-paced historical thriller set in Victorian Glasgow, "Saints and Sinners" brilliantly captures the desperation and poverty riddling the Irish immigrant community of the city's East End. Told through the varying perspectives of the three main characters - a fugitive, a priest and a prostitute: two brothers and the woman they both love - Paul Cuddihy's debut novel depicts the conflicting devotions of Victorian society. Mick Costello, on the run from the British authorities, flees Galway for Glasgow, but is still being hunted. Once across the water Mick catches up with his brother, Thomas, a Catholic priest involved in the murky world of Irish republicanism on the orders of the Church hierarchy. Both brothers fall in love with Kate Riordan - a Donegal girl working as a prostitute. Allegiances are tried and loyalties tested as each character struggles for redemption on the unkind streets of Glasgow. And as the plot thickens, with pledges of faith clashing with the passions of love, the novel's stunning climax will find each character facing a decision that could shatter their lives forever. Anyway, it might be good. I love this kind of novel! I just put it on my library list. The problems facing the Irish when the English decided they wanted their country are hard to fathom. The scars from actions take since the 1600's still haven't healed. During the Victorian era many of those scars were still fresh. Those caught up in the Irish resistance lived on the edge had to make hard choices. This book sounds like it will dig deeply into the problem and those caught up in it. I'll definitely be watching for this one. I like reading novels on the Irish.